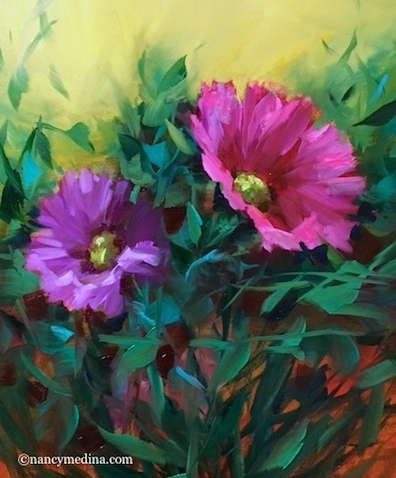 Duet Daisies is the newest painting in Flower Mound Studio, featuring a little dance of cool and warm violets in a breezy garden. It was a warm one in my own back yard garden today, although a nice thunderstorm drifted in during the afternoon hours to give the tree lizards a drink. I had a visitor last night that I've never before seen here in Flower Mound, a nice large toad was hopping around my flower beds, looking for June bugs. I turned on the hose to give him a wet puddle in case he was thirsty, and asked him to be sure to eat some of those pesky mosquitoes for me.